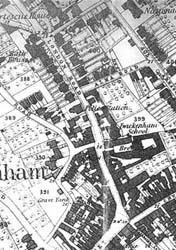 There are fragmentary records of theatres and theatricals in Twickenham through much of the 18th and 19th centuries. A community which first included Colley Cibber, then David Garrick, Peg Woffington, Kitty Clive, Hannah More, Dorothea Jordan, Hannah Pritchard and John Beard may have called for a play-house for the entertainment of its residents and seasonal visitors. In 1730 Thomas Chapman (c1683-1747), then managing the Richmond Hill Theatre*, brought his company over to Twickenham. They shared their time between Richmond and Twickenham until 1753 when they stopped coming because of falling attendances. Chapman actually opened a playhouse in Twickenham in 1745: what sort of building his company had been using in the intervening 15 years is not known, but on 4 June 1746 John Beard (he came to live in Hampton in 1767) appeared as Macheath in John Gay's "The Beggars Opera", at Twickenham. ** According to the Oxford Dictionary of National Biography Dennis Delane or Delany (1694-1750) put in a special appearance at Twickenham on 21 September 1749 as Manly in Wycherley's The Plain Dealer. Evidence for an early building rests on contemporary documents. The first is an advert in the Daily Advertiser Monday 22 July,1745, stating that "Twickenham Theatre will be open'd tomorrow with a Concert of Musik, in two parts. Boxes 3s, Pit 2s, Gallery 1s. Between the parts of the concert will be given gratis a comedy call'd The Conscious Lovers. To begin early at seven o'clock". This seems to have been the newly built playhouse. 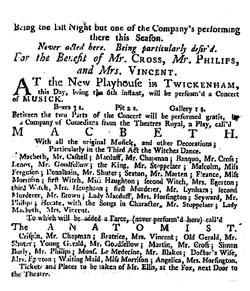 The second is the playbill shown here, which dates from 1746. Clearly the playhouse was a going concern at this time. It is likely that Cole was approaching the town centre from the north via the London Road. York Street did not exist and the description hardly fits Church Street where, excepting the Manor House opposite the church, there were no front gardens. The memorial he saw had been erected in about 1707 by Mathias Perkins, a barber-surgeon who came from a Petersham family. He owned, and probably worked from, property on the west side of London Road “known by the name of the Swan…near the Stonebridge”. Perkins was Mrs Whitrow's executor and may have been related: she too had come over from Petersham. It seems likely that Perkins erected the memorial on his own land and that this lay between the start of Holly Road and the bridge (the “Stonebridge”) over the Crane River. So, where exactly was this play-house in 1746 and 1762 and was it on the same site in 1789? 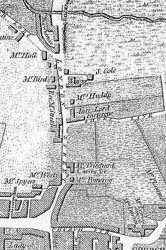 There were, in 1762 only a few identified properties on the east side of London Road. At the beginning was a brewery. 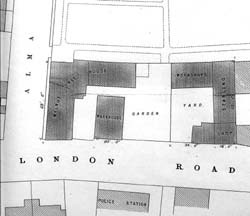 Named no1 London Road, this consisted of a number of buildings on either side of an entrance and courtyard stretching back to what is now Garfield Road. Some of these fronted London Road and it is conceivable that a small play-house had been established in one of them. However, this seems unlikely because the monument in Mathias Perkins' garden opposite the playhouse was surely not so close to the town centre. Next to the brewery was a property, first identified in 1777 as “Mrs Pomeroy's School”: it cannot at present be established when it was built. Next was a property which came to be known as Walnut Tree House. This house was on the corner of what was earlier called Alma Road and today Katherine Road, now a pedestrian passage. Walnut Tree House had been bought by a corn chandler, John Jorden in 1764 and he leased it to Lady Frances Shirley in 1775. She died there in 1778 and the next occupant was a Samuel Pritchard. He remained there until 1798. Farther along the road, past open land, was an alehouse known as The Fox Alehouse until 1743 when it was renamed The Three Tuns. The playbill of 1746 notes the the Fox was "next door" to the theatre, but this may be an imprecise description: it had already been renamed. Samuel Lewis drew a map of Twickenham, published in 1784, and he marked Walnut Tree House as occupied by “Mr Pritchard Carver &c”, as well as Mrs Pomeroy's school house. There is no mention of a playhouse on this map, although there is a small building between the two properties. Walnut Tree House was offered for sale in December 1877 and the plan accompanying the Particulars shows a small free-standing building, described as “a TIMBER BUILT WAREHOUSE adjoining with slate Roof, known as 'The Twickenham Auction Mart'”. The building was about 20' x 30'. Could this building have started life as a small playhouse? R S Cobbett stated (Memorials of Twickenham, 1872) that Mr Pritchard used his property as a shop from which he ran his carving and gilding business. He seems to have been a person of substance but it is perhaps stretching credulity to suggest that he was of the same family as Hannah Pritchard, the actress who had owned Ragman's Castle on the riverside. Beyond Walnut Tree House there was open ground: Crown land, a part of the Twickenham Manor Park, then Shews (sometimes Shoes) Lane, now Arragon Road. Across this road was another property, then the large mansion known as Fortescue House, built in about 1769. Next was a property owned or occupied by David Franco from 1760 until 1778 when he died, and Mrs Huddy from 1781. The property was owned by the Cole family who lived next door, towards the Crane River, opposite their brewery buildings on the other side of the road. This makes the land occupied by Fortescue House a possible site for the playhouse, but only until 1769. The property on the north side of Shews Lane was probably occupied by the Rev Lyscombe Maltby Stretch, proprietor of the Twickenham Academy across the road, from about 1777, which came to be known as Bath House. Mr Stretch's house can be sited here because he had caused a paved way to be laid connecting the two buildings, crossing the road. This came to the attention of the trustees of the Turnpike (as the highway had been classified since the Act of 1767). The fastidious Mr Stretch had to remove the paving and this also removed an obstacle to his becoming a trustee of the Turnpike. This property seems, later, to have been joined to Fortescue House and is shown as such on the 1817 Enclosure map (no699, Edward & Joshua Chapman). Sometime between 1796 and 1801, Count Stahremburg, then the owner of York House built a small theatre in the house for the presentation of amateur theatricals by himself, his family and staff (see York House, Twickenham, Dr T H R Cashmore, Borough of Twickenham Local History Society Occasional Paper No4, 1990). Also, at about this time Mrs Ann Seymour Damer (living at Strawberry Hill) and Lady Elizabeth Cole (n�e Stanley) were mounting performances somewhere, perhaps at Strawberry Hill (see The Cole Papers, G E Mercer, Borough of Twickenham Local History Society Paper No56, 1985). Mrs Damer bought York House from the Count on 1818. Amateur theatricals may have continued there. 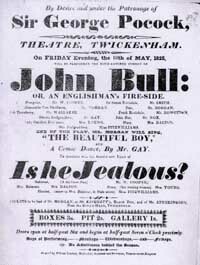 A later playbill, of 1825, mentions a “Theatre, Twickenham”, advertising a performance on 18 May that year, under the patronage of Sir George Pocock the owner of Orleans House (as it was later called). No address is given but there were boxes, a pit, and a gallery and performances took place on Mondays, Wednesdays and Fridays. In 1877 Twickenham's first Town Hall was built, incorporating an auditorium of which the shell still exists, behind the south side of King Street. Known today as the Queen's Hall, it acts as a centre for learning martial arts. Here, in 1881, Lillie Langtry made her debut, coached by Henrietta Hodson, the actress wife of Henry du Pre Labouch�re then living at Pope's Villa. It seems possible that this building superceded the Theatre. Records show that the auditorium was leased out: in 1888 John Nash Goatly was granted a licence for performances of music and dancing. THE RICHMOND SHAKESPEARE SOCIETY was founded in 1934 by Gladys Eriksen, former actress and dancer, with a production of Shakespeare's "MUCH ADO ABOUT NOTHlNG" at the old St. Mary's Hall in Twickenham. There followed 70 years of Open Air Theatre, initially in the Terrace Gardens on the slopes of Richmond Hill from 1935 to 1970, then at Marble Hill House from 1971-1987, and in York House Gardens from 1988 until the present time. Throughout the war years and with restricted male membership the Society provided entertainment in large air raid shelters and Red Cross centres and performed Shakespeare in the Terrace Gardens as part of the government's "Holidays at Home" scheme. Peacetime brought a glut of amateur societies and some 30 of them - the RSS included - performed annually in the Thames Valley Theatre Guild Festivals. In the meantime we had established our own 80-seat Cardigan House Little Theatre on Richmond Hill in the British Legion's club premises (demolished in 1966 and now a block of flats) where we presented a high standard of Shakespearean and classical productions. From 1966, finding itself without a permanent home, the Society performed at St. John's Hall, then at Cardigan Hall (the British Legion again) and then in pub theatre at "The Britannia" in Paved Court until 1981. The pub theatre performances were just part of a substantial fund-rising exercise for, in 1977 and due to the foresight and efforts of the Chairman and Committee, the Society had acquired a derelict building on Twickenham Riverside which, with the aid of a generous legacy from a much loved Secretary, became the Mary Wallace Theatre, where now it presents 10 productions of Shakespeare, the Classics and modem and controversial plays each year. The building has had a chequered life, having been built in 1870 as a Mission Hall attached to St Mary's Church and designed by Robert W Edis. The land was donated by John Bowyer in 1869. In 1892 an annexe serving as a soup kitchen was built providing hot food for the needy during hard weather. It has also been a private residence, a school and a Scout hall. Today the auditorium, foyer and bar host many other artistic projects and talks, and the Society, one of the area's premier drama groups with a large membership; both Acting and Audience, has clearly attained a unique place in the community. In 1927 a group of amateur actors started Teddington Theatre Club, performing at Elleray Hall in Teddington. In 1970 the club converted the old ballroom of Hampton Court House into a theatre. In 1971 the Club was able to open Hampton Court Theatre and stage their first production there. In the 1990s it became clear that Hampton Court House was going to have a change of use: the club would have to find new premises. After negotiations with Richmond Council and other interested parties a site was found in Hampton Hill. A fund raising exercise was launched and in 1995 the foundation stone for Hampton Hill Playhouse was laid and the shell of the Playhouse built. However, the need for further funds was evident and an appeal was made to the Arts Council for lottery funding. This appeal was unsuccessful. From 1996 to 1997 the club was able to stage their productions in Vera Fletcher Hall, Thames Ditton. During this time a second lottery appeal was planned. This bid was successful. In 1998 the Playhouse was completed and opened with a gala performance. The Playhouse has an auditorium seating 200 and a studio seating 50. TIC set about greatly increasing its active membership and its audience membership. In keeping with Arts Council expectations for the playhouse to be a centre for the wider community provision was made for visiting amateur and professional companies. The works of writers, artists, composers are fostered. A theatre company performed in Twickenham from 1730. Between 1745 and 1762 a playhouse stood on the east side of London Road, possibly opposite today's Police Station or on the corner of Arragon Road. In 1789 and 1825 there was an advertised theatre in operation which may have been on the same site: no other site can be suggested in the centre of Twickenham although research of the relevant Manorial Courtbooks might throw some light on the matter. Amateur theatrical performances took place in a small theatre in York House and at Strawberry Hill in the early years of the 19th century. The theatre may have been finally superceded when the Town Hall was built in 1877. The 20th century saw the creation of the Mary Wallace Theatre in the old Mission Room on Twickenham's riverside, and later the building of the Hampton Hill Playhouse. *The first “custom-built” Richmond Theatre was opened in 1765 on the corner of the Green, at the top of Old Palace Lane. David Garrick wrote a prologue for the opening on 15 July. There had been a theatre, in a converted barn, on Richmond Hill from as early as 1719. **A John Beard is listed as a ratepayer in St Mary's Churchwardens' Accounts between 1746 and 1789, though he never seems to have paid the small rate and in later years no value is attached to the assessment. A similar picture is shown in the Poor Rate Assessments, although payments were apparently made between 1754 and 1760. John Beard, the actor/manager and singer, died at Hampton in 1791: it is tempting to embroider speculation with conjecture that he was the manager or sponsor of the Twickenham Playhouse during this period, an enterprise of dubious solvency and only intermittent operation. ***BL ADD MS 5,841, vol.XL, p174. An earlier reference to this memorial, Extracts from a Pocket Book of T T(anner) reproduced in “English Topography Part VII” (1896) confirms the existence of the memorial: “Coming from Teddington towards London on June 17, 1723, I saw upon the left hand of the road, just as I came out of the town of Twickenham, something that looked like a monument, built up pretty high above a brick wall but raised up from the field or garden enclosed by a brick wall….”. This diarist was told by a bystander that it had been erected by Mathias Perkins.